No matter how controversial the early Christians were, no matter how many enemies they made because of their abstinence from temple worship, they still had a job to do, and it was urgent. The early Christian communities lived their just life outwardly. They gave generously to the shared purse, and used their resources to feed the poor. Acts says there were no poor among them. The radical generosity of the early communities was unheard of at the time. They grew quickly as many of the poor and marginalized came to them for aide. This was their testimony of the coming Kingdom. They preached a Saviour and Lord other than Caesar (who called himself by both titles), and showed the people that they could be provided for outside of the "Pax Romana". The warning and command in this passage is to avoid controversies and arguments within the community. They had a purpose, to actively demonstrate the generous and just Kingdom. Arguments over minor points of doctrine would only serve to distract the community from its very important task, for which many were urgently needing them. The radical generosity of the early church was to be distributed as universally as the gospel itself. Paul reminds Titus that they themselves were completely unworthy of the grace given by Jesus. God has been generous to them, though they were entirely corrupt. Therefore, our actions and generosity toward people are not bases on their worthiness or righteousness. We are agents of his divine unconditional love. We cannot judge. Freely we have received. Freely we give. 4 But when the goodness and loving kindness of God our Saviour appeared, 5 he saved us, not because of works done by us in righteousness, but according to his own mercy, by the washing of regeneration and renewal of the Holy Spirit, 6 whom he poured out on us richly through Jesus Christ our Saviour, 7 so that being justified by his grace we might become heirs according to the hope of eternal life. 8 The saying is trustworthy, and I want you to insist on these things, so that those who have believed in God may be careful to devote themselves to good works. These things are excellent and profitable for people. 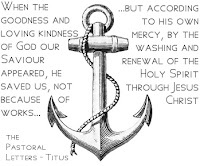 This generosity extends to the previous verses at the beginning of this chapter and the end of Titus 2. The Romans were persecuting the early Christians, often to the death. Many of them were enslaved by Rome. Paul himself was a political prisoner. They subverted the practices of Rome by refusing to worship the Caesar or sacrifice in the local temples. If anyone should deserve the hatred and rebellion of the early Christians, it was the government of Rome and the systems it represented. But Paul says that the generosity offered to us in forgiveness and redemption is to be offered by us freely to all. Remind them to be submissive to rulers and authorities, to be obedient, to be ready for every good work, 2 to speak evil of no one, to avoid quarrelling, to be gentle, and to show perfect courtesy towards all people. Instead of open rebellion in the face of a contrary empire, they were to look for opportunities to do good works. They were to generously bless the authorities that sought to kill them. This instruction echoes Jesus words in Luke about loving our enemies. “But I say to you who hear, Love your enemies, do good to those who hate you, 28 bless those who curse you, pray for those who abuse you. 29 To one who strikes you on the cheek, offer the other also, and from one who takes away your cloak do not withhold your tunic either. 30 Give to everyone who begs from you, and from one who takes away your goods do not demand them back. 31 And as you wish that others would do to you, do so to them. Many of the early Christians went to their grave at the hands of the agents of the empire they had refused to hate. This demonstrates the truly radical inclusion of the gospel. We who were enemies of God have been accepted. Therefore we will now live justly in an unjust world. We will live in unity in a world defined by self-interest. We will give generously to all without condition or reservation. We will love our enemies even to the death. At the centre of it all is the gospel of Jesus, who sets us free and enables us to live the new world from the inside out.